Allison Valley Development Company (AVDC) planned The Farm, a new community to the north of Colorado Springs and close to I-25 and Interquest Parkway. The Farm is the area's newest master planned community with tranquil ponds, open spaces and miles of recreational trails. Homes from the low $400's offer the freshest architecture from the finest local builders.The property itself was bounded on the south side by Black Squirrel Creek. To add appeal to the new community, the developers wanted to provide access to the nearby commercial center, which included a movie theater, restaurants, and Great Wolf Lodge, a family friendly indoor water park resort opening at the end of December 2016. In the years leading up to the project, the Colorado Springs area received incredible amounts of rainfall that significantly changed the creek alignment. Taking the potential for abutment scour into consideration, Classic Consulting, the project's engineer, determined that a bridge at least 183’ in length would be necessary to span the creek. Contech Engineered Solutions worked with Classic Consulting to provide the structural design of the pedestrian truss bridge (which is also part of the planned city trail system), while also coordinating with them to find a solution to carry a sewer line across the creek. "With the sewer line running underneath the bridge, we were able to avoid having to install a costly sewer lift station in addition to the pedestrian bridge," added Chris Jorgensen, PE, Project Manager with AVDC. A 183' x 10' Connector®-style Continental® truss structure was selected as the best solution for its ability to meet the demands of the project. The truss structure was able to carry pedestrians, as well as a sewer line, across Black Squirrel Creek. Tezak Heavy Equipment (THE) was selected as the contractor for the bridge installation. THE devised a way to dewater and construct temporary supports on either side of the creek. After being manufactured at a local plane, the bridge arrived on site in three-61' long pieces. Due to site access limitations and the length of the bridge, it was necessary to install the pieces on shoring towers via crane and then assemble the bridge while it was already in place. Typically, truss bridges are assembled on the ground. Despite these challenges, the structure was installed in just two days. 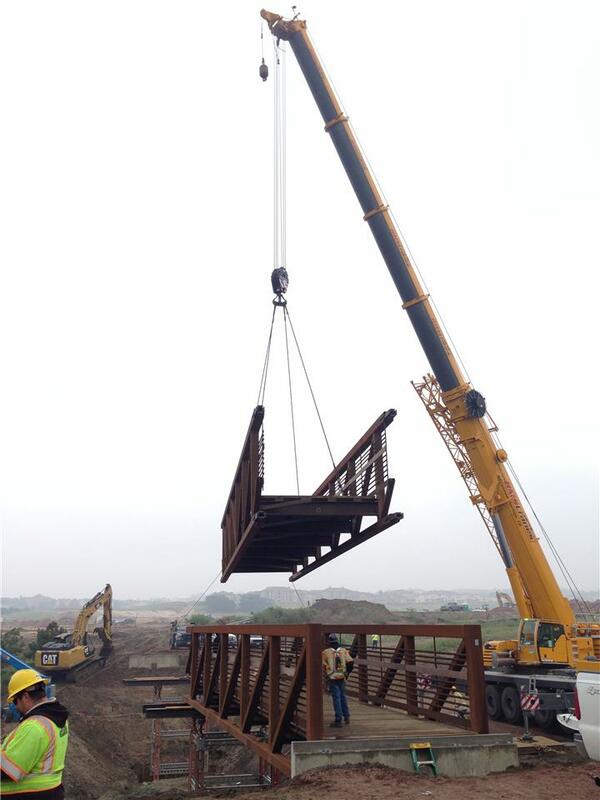 "The Continental Bridge connection system went together quickly and easily, even with having to assemble the bridge in mid-air," stated Bryan Danner, PE, Project Engineer and Estimator with THE. "The finished bridge is incredibly solid while supporting heavy utilities, maintenance vehicles, and pedestrians over the long 183 foot span. Contech’s technical support really helped to make sure that everything went safely and smoothly." Since AVDC had never utilized a bridge this long before, Contech was able to ease the owner's concerns by providing experience and expertise, the presence of local engineers, as well as a list of capable and trusted contractors. The result was a smooth and successful installation and project for the private development company. "We enjoyed working with Contech's representatives," concluded Chris Jorgensen. "They gave us good insight and helped with bridge choice, design, procurement, and delivery. We were also very pleased with their recommendations on contractors who could install a bridge like this. They recommended THE, who is a first class outfit. THE was able to help value engineer our project, save on project costs, and deliver an excellent project."